When Honda needed to develop a finished vehicle shipping terminal at its newest North American assembly plant to stringent cost, schedule and quality standards, the leading car manufacturer chose TransDevelopment as the terminal planner, designer and general contractor. The $10-million turnkey facility was completed on a fast-track basis in only 11 months; partial rail operations launched in six months. TransDevelopment’s concept-to-completion responsibility included all major track, site and civil work. Features of the 150-acre terminal include eight loading and seven setout tracks, with room for 300 multilevel railcars. 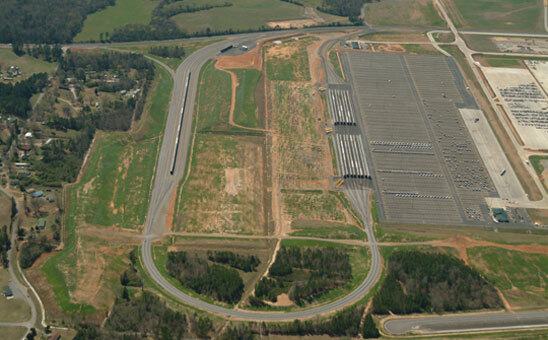 The terminal has zone paving, a rail support building, an efficient yard management layout featuring a perimeter haul-away plaza, and a vehicle capacity of 4,000 units.